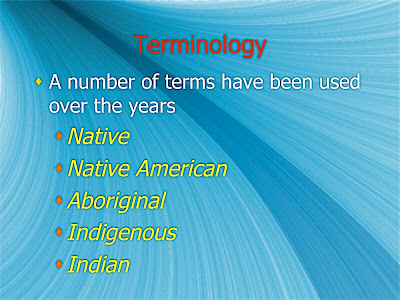 Slide 2: These terms are typically applied by non-Native people to tribal groups. 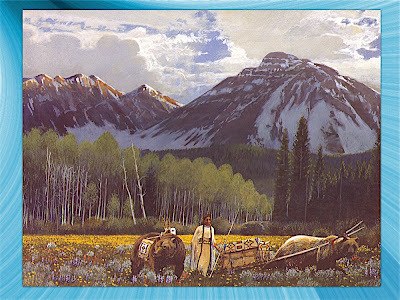 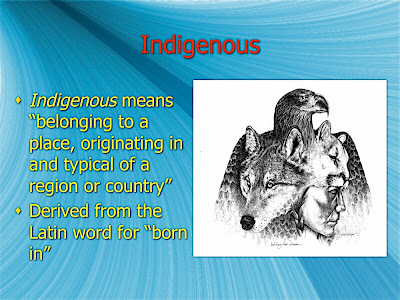 Most Indigenous people typically avoid collective terms whenever possible and refer to themselves by the name of their tribe or band. 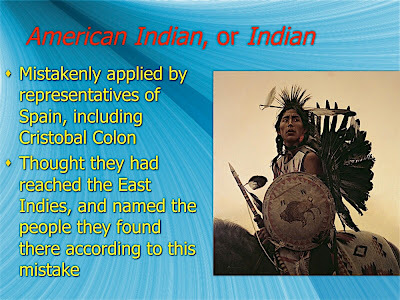 Slide 4: Even though this term has become widely used and is the generic term accepted by most Indigenous people in the US, it was actually based upon a foolish and arrogant assumption by Columbus and his followers, who thought they had crossed the ocean to Asia and were dealing with people from the East Indies. 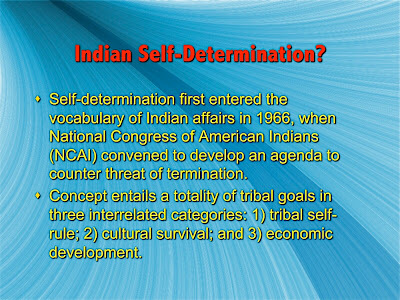 To this day this is why the outer Caribbean Islands are referred to as the West Indies. 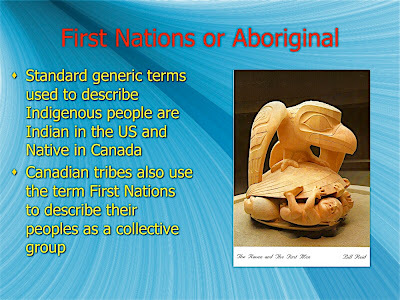 Slide 5: British Colonial attitudes described Indigenous peoples as Aboriginal or First. 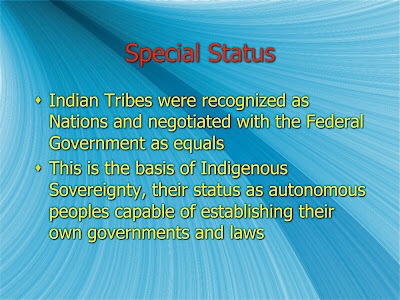 When Canadian peoples decided to emphasize their political status in the 1970’s they decided to refer to themselves as First Nations. Slide 8: Once gain the issue of land and how important it is to Indigenous peoples in EJ issues can be seen here. Slide 10: Understanding Treaty Law is very important in Indigenous Environmental Justice because tribes have special legal status in relation to the federal government that allows them to set environmental standards that can be much more stringent than state standards and even more stringent than federal standards should they so choose. Slide 12: One major legal implication of this was that tribes could set environmental standards. These had to at least be as stringent as Federal Law, but they could be more stringent. This means that states whose air or water impinged on tribal lands also had to meet these standards, even if the state had little or no regulation on such matters. Slide 13: EJ is an important aspect of human rights, and it can be a crime to not provide it. An interesting discussion can be held over what this means and why the right to a healthy and natural environment can be as important as the right to vote or to be heard in court. 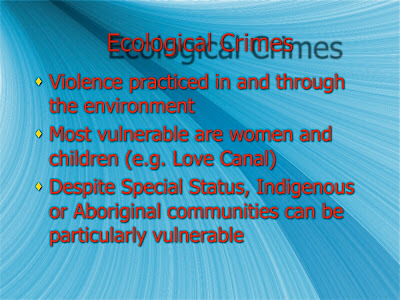 Slide 14: One reason that crimes are involved is that impacted individuals, who are most often women, children, and the elderly, can die as a result of such activities. Bhopal in India is one of the most obvious instances of such actions. Slide 15: Source: Robert Bullard, Clark, Atlanta University, Earth First Journal, July 1999. 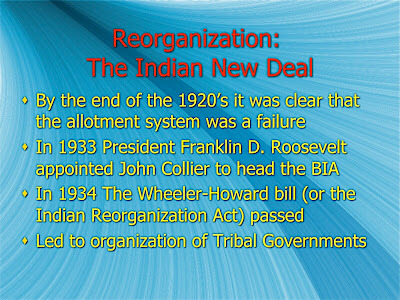 Slide 16: How EJ is dealt with depends very much on who is in control of congress. 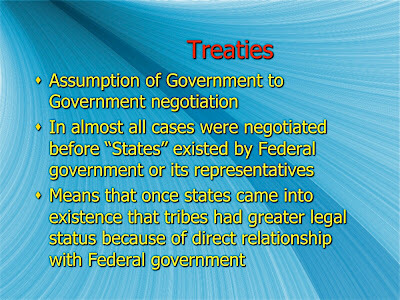 Congress can set aside or abrogate treaties if they feel so inclined. 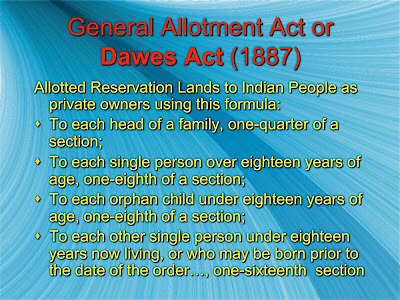 This was the basis of both the Dawes Act and the later Termination Acts. The Dawes Act effectively broke up the physical nature of a shared land and allowed other people to take over tribal land, even though it was supposedly held in trust by the Federal Government. This is another reason that land and the ability to control what happens on the land is so important in EJ. 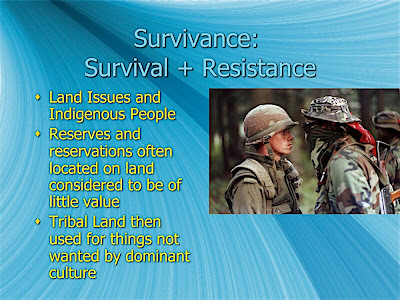 Slide 21: Indigenous people are no longer passively accepting decisions imposed upon them by outside. 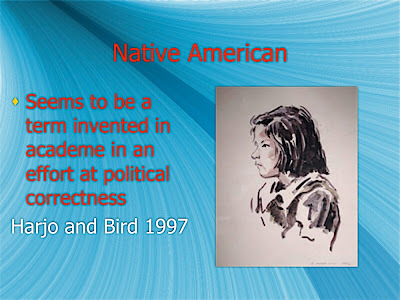 In Canada this has sometimes become very confrontational as in the case of the Mohawks and Oka, where the Quebec provincial government decided to take land claimed by the Mohawk First Nation and build a golf course.